Since I wrote the post below, we’ve been to Sicily’s St. Joseph festivities many times, and have added this and other events to our Walking and Cooking in Eastern Sicily tour . The March 15-21, 2019, tour was a great success, and we’ll be doing a similar tour in 2020. The 2020 dates are not yet confirmed, sign-up for our newsletter to get the latest news. 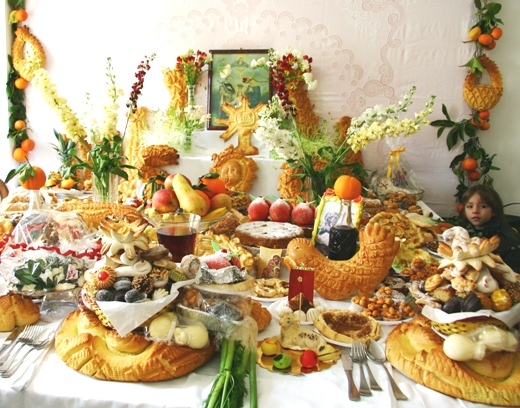 We were stunned, and the woman who owned the house, Signora Bellassai, proudly stood by as we gaped at this sumptuous tavolata di San Giuseppe, a table laden with special breads and sweets in honor of San Giuseppe where a festive meal will soon take place. We were invited to look at each lovingly prepared dish displayed on an immaculate hand-embroidered tablecloth, as she explained the symbolism in the shapes of the traditional breads, and pointed out the various sweets and decorations. This being Sicily, in the midst of this food riot, there was a big plate of cannoli. Now this is my kind of feast day! The Signora guided us around the table, and we discovered as we gazed upon the myriad of goods, that there were also savory dishes – a spinach pie, zucchini fritters, tiny cheeses, as well as little plates of sprouting lentils and green shoots of wheat, as a harbinger of an abundant harvest on this eve of spring. At the head of the huge square table were 3 seats, each with a huge round loaves of decorated bread and a tower of sweets, and one had a 5 euro note pinned to it. These were the places for the characters of the holy family, Joseph (Giuseppe), Mary and the child Jesus, who were represented by 3 townspeople of the Signora’s choosing, usually people in need or who had undergone hard times in the past year. We are salivating as we wonder if we qualify. Emanuele suggests that he bears an uncanny resemblance to San Giuseppe while I wish I’d worn my old coat. With great disappointment, we are told that the guests have already been chosen. The breads and sweets are a gift for the “holy family”, but first they would be served a pasta dish, made with a special sauce. When quizzed about this, Signora Bellassai disappeared into her kitchen and returned with a small bowl of warm tomato sauce and 2 spoons. Finally, something to eat! I tried to identify the unusual aromatic accent to the delicious sweet tomato, and was able to identify cloves and cinnamon- there also small bits of vegetables and another spice that had an incomprehensible name in Sicilian dialect. By now several relatives had joined us in the living room, though no one could remember the name of the spice in Italian. As we were leaving, Signora Bellassai tucked a few almond sweets into my hand, so my starving hangdog look paid off. We discovered that there were nearly 20 of these “tavolate” on display during the week-long festivities, and having now taken the true meaning of this festival to heart, went off in search of more snacks. 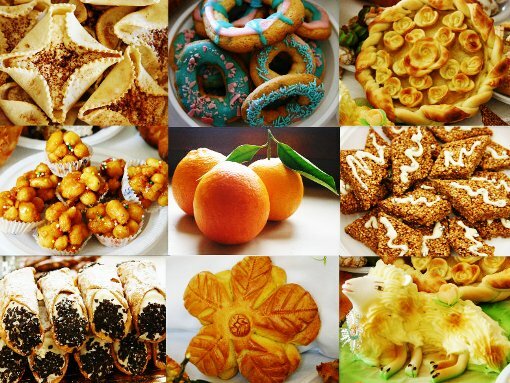 A few items from the Tavolata di San Giuseppe: Cassatelle ricotta tarts with cinnamon, bracelet cookies, a decorated savory pie, cobaita sesame crunch, marzipan lamb, flower-shaped bread, cannoli with chocolate bits, pignolata drenched in honey, blood oranges. La Tavolata di San Giuseppe in the town of Santa Croce Camerina is part of the week-long celebration in honor of St. Joseph, the town’s patron saint. Feast day is March 19. The town is in eastern Sicily, about 20 km south of Ragusa. My parents always took me to the St. Joseph’s table each year in Paterson, New Jersey, and it was amazing. I believe my grandparents were from Santa Croce Camerina. Tonia – I didn’t realize they had this tradition in the USA, but if your grandparents were from Santa Croce Camerina, it makes sense that this important tradition would have travelled wih them! My mother just told me that my great grandmother, natalizia Ferraro, was from Santa Croce camarina. She then moved to Paterson, nj. She was the president of the ladies auxiliary for many years. My mother was there all the time as a child, & looking at the picture brought back many fond memories! So glad this post brought back fond memories for your mother, Laura. You should come and visit, too! wonderful article. I am total Sicilian. So proud. I had a St.Joseph Table a couple of years ago. the bread with the doves. I made a St. Joseph Table a few years ago. I would like to see more breads with designs. Also, how are the designs made? When I was very young, I was chosen by a family friend to portray Mary at her St. Joseph Altar. After knocking on two doors, we were welcomed in at the third house. It was an experience I will always remember. I hope you managed to take in the St. Joseph festivities in Sicily – interesting and fun!